Today is Blog Day. Like last year, we are once again celebrating one of Blogophere's quirky charms, our linkiness. Bloggers all over the world are introducing their readers to five new blogs, helping build the ever denser web of connections in our world. The Blog Day organizers encourage bloggers to reach out to those from cultures other than our own. But I think I'm going to do something a little different. A perpetual wanderer, I seem to have written more about elsewhere than about my own culture, so for this blog day I've decided to go back home to my roots. I'm going to introduce you to five blogs from Southeast Asia. These five beautiful blogs not only tell great stories, but enrich them with photographs which are woven with their words to form a rich texture that is simply transporting. Zagat Guide goes to China.....or does it, really? Partying like a food blogger. Attack of the Giant Squirrel. Eat these before you die. 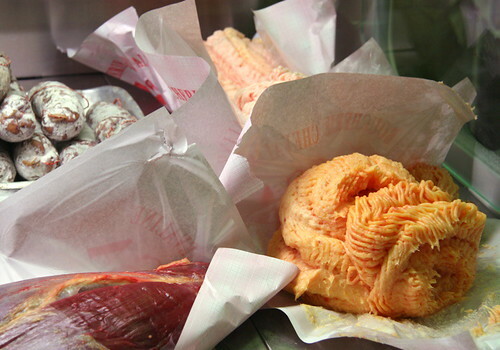 What is weird food anyway? I don't really know. Perhaps we should ask Eddie. Reading the comments and emails I got from the horse fat fries posts, I realized that my weird meter is probably calibrated quite differently from other people's. Using horse fat as a frying medium sounds basically normal to me. I'd never, knowingly, had horse meat or other horse products, but that was more because I never had easy access to it than because I was weirded out by it. 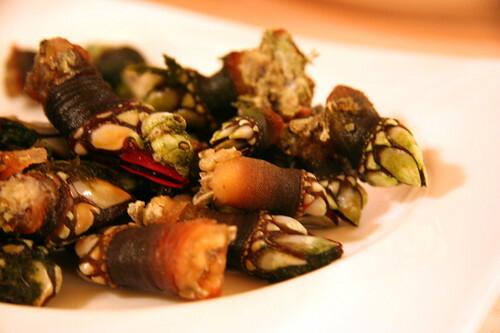 I grew up in Thailand, and we ate all kinds of stuff that people here or in Europe might find weird. 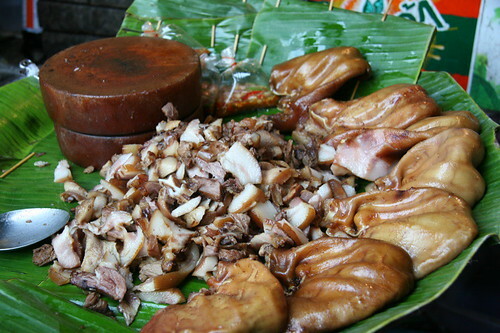 The stewed pig's ear in the photo above is one example. Deliciously gelatinous and crunchy at once, they are eaten dipped in a sauce made with lime, fish sauce, garlic, and chilli. We also eat these little crabs, deep fried and dipped in a sweet and sour sauce, a macabre sort of chicken nuggets I guess. 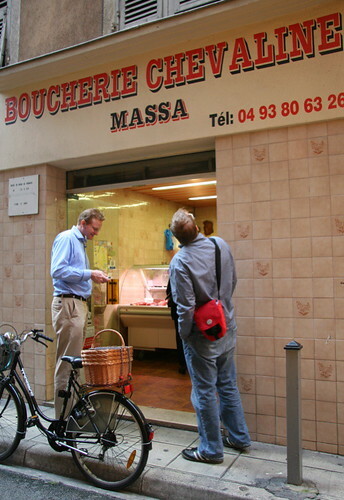 Last week I wrote a little post about one of our cooking adventures while in the South of France last year, where we cooked our first batch of fries in horse fat, which our friend Mikael sourced from one of the horse butchers in Nice. Jeffrey Steingarten who is one of my favorite food writers –I have a soft spot for grumpy old men, especially the pedantic ones- also wrote about horse fat fries in one of his columns in Vogue magazine a while back. Quite a few of you left comments and emails, asking what about the horse fat that makes it such a great medium for fried potatoes. Alas I had no idea. I could only tell you what I tasted. Frankly, I was quite curious about it myself. Can you describe how the fries were different, or especially good? Horse fat is actually sort of intermediate between solid animal fats and liquid vegetable oils. It's harder (more saturated) than the latter, but softer than tallow or lard, not too different from chicken or duck or goose fat. So I wonder whether it was maybe a difference in the flavor more than the texture? Because I don't see how the consistency of the fat itself would make a distinctive difference in the texture of the fries. Tell me what you remember about them, and I'll see how good of a rationalization I can come up with! We put our Camilla to sleep this morning. We were up with her last night til the early hours of the morning. She was tired, we took turns petting her, comforting her. Even though she was sick and exhausted, she was purring, content with our love and attention. She woke up this morning even more tired. We took her to the clinic for her scheduled surgery. We didn't want to put her in the carrier anymore so David drove while I held her on my lap, wrapped up in my pale pink bathrobe. Camilla loved our bathrobes, every time she found one on the floor or the bed, she would climb into it and sleep. So I've been wrapping her in my bathrobe to take to the vet. We thought it would give her some comfort. Her vet wasn't happy when she saw her. Even less happy when she found her temperature below normal. I thought it was good that she didn't have a fever, but the doctor said that it was a sign that her body had given up the fight. Evidently the second antibiotic we put her on to prepare for the surgery didn't work. Her body was failing. She told us that there was a very slim chance that Camilla would make it through the surgery. 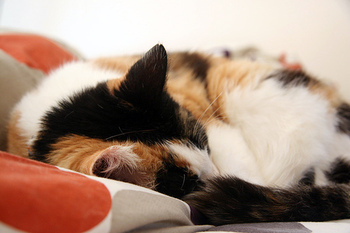 It's a critical surgery even for otherwise healthy cats, and Camilla's body was failing. Yet without the surgery she wouldn't survive. We've run out of options to fix her medically, as she was no longer responding to antibiotics. We decided not to put her through the trauma of surgery. She's been through enough already in the past week alone. The procedure at that clinic is to give her something to go to sleep, and then after that the doctor will take care of the euthanasia. We stayed with her after the doctor gave her the first injection, petting her. She was purring softly, still wrapped up in my bathrobe. She was very weak, but she was still our Camilla for a time. I scratched her nose, she liked it. David rubbed her ears, she loved that. Every time we called her name, even when her eyes were closed, seemingly asleep, her ears perked up. We stayed with her until she was completely asleep, when her ears didn't perk up anymore when we called her name. We left her in the care of her vet, who would do the surgery anyway to learn what she could in order to save other cats with the same problems. Camilla was sleeping peacefully when we said our goodbyes, embraced in the softness of my pink bathrobe. 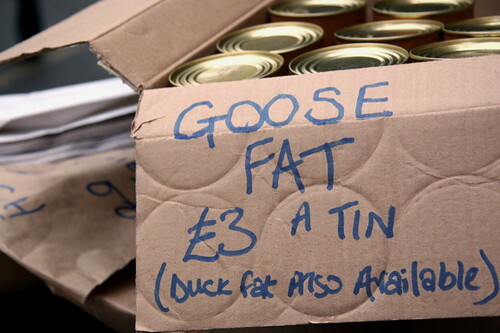 How can you not love a market where you can buy goose fat by the tin? And duck fat too. Where's the market, you asked? Why, Borough, of course. Goose fat makes superb fries, and so does duck fat, although the best oil for fries, I must say, is horse fat. When we were in the South of France last year, my friend Mikael sourced some horse fat and we cooked up some french fries -ahem, frites- in it. Gloriously beautiful fries we got from that rendered horse fat. Tags: "Horse fat" "Frnech Fries" "Fries"
Can you see it now? A headline on Style.com, no? Well, never you mind, perhaps it's just me who thinks this guy perfectly accessorised. But then again my idea of a perfect Christmas present is three pounds of bacon from the Grateful Palate catalog. 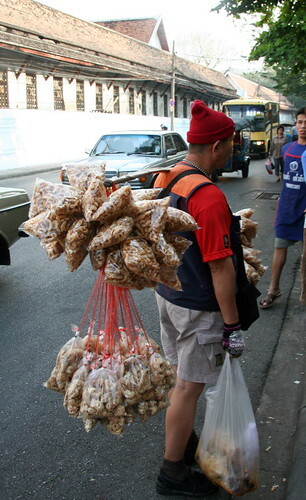 I found him peddling little bags of deep fried pork crackling as I wandered the Ta Prachan market in Bangkok with Austin. 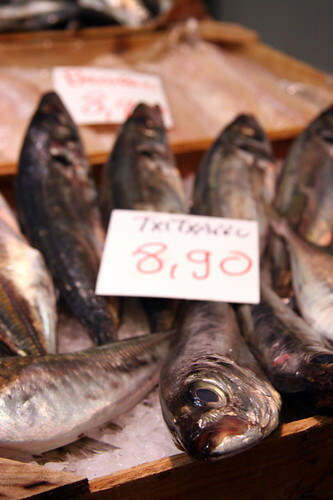 I've been looking through the photos I took while in San Sebastian, and found a few rather macabre shots from the Pescaderia or the old fish market in town. I thought it would be fun to share them. When asked where the beautiful Turbot on our plate had come from, our waiter simply gestured toward to sea just beyond the windows. "Everything we serve here come from right there", he said. Elkano is that kind of restaurant, where deceptively simple technique gives way to the superlative freshness of the local ingredients. And that's precisely why we had gone there in the first place. We had arrived only a few hours prior, a flight from Paris to Biarritz, on the French side of the Basque country, then an hour or so drive to San Sebastian. After a brief rest at the hotel, our friend Mikael joined us for the drive to Guetaria, for dinner at the famous seafood house Elkano. And so began our saga of driving –or getting lost, rather- in the maze that's the highways and byways of Donostia. By the time we arrived at the restaurant it was far too close to midnight, having gone over 40km the wrong direction and back again. We rehearsed the starving children look with each other in the car, hoping to be pathetic enough that they would serve us still, despite the hours. Happily, we once again underestimated how late people ate in Spain. Not only that they took us in without complaint, two more tables arrived even later than we did, and the restaurant seated them without missing a beat. We took a quick glance through the menu, though it was just for show. We knew what we had come all that way for, and it's the Turbot. That majestic fish, whose sweet, succulent flesh and gelatinous bones are considered by many a great chef to be the very finest specimen of fish in the world. We told our nice waiter that we were there for the Turbot. Yes, we came all the way out here for the Turbot so could we PLEASE have a Turbot, and might we have it NOW? Calling all food photo enthusiasts! In case you haven't heard, Food & Wine magazine is running a food photo contest. You have between now and September 15 to enter your photo. One per entry person, and the person has to be a legal US resident –sorry readers from elsewhere. The contest rules are written in Legalese (heh), but from what I gathered it's pretty much anything that is 'food related'. 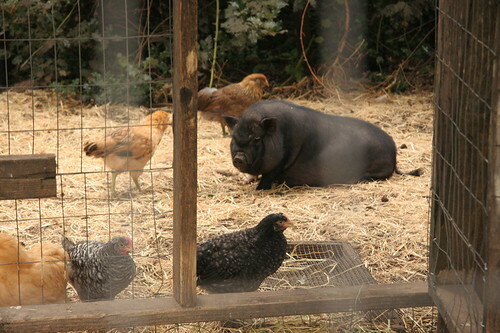 So I supposed my picture of Dali the resident Pot Belly at the Manresa biodynamic garden qualifies, if only in the Michael Pollan-esque sense of the term. The prize is actually pretty cool, and is perfect for someone who wants to take photography, food or otherwise, more seriously: a Canon EOS Digital Rebel XT camera kit for the Grand Prize winners and a sprinkling of books and things for the four 'First Prize' winners.